Jora, a Nord, is a priestess of Talos at the Temple of Talos in Windhelm. She runs the temple with her husband Lortheim. 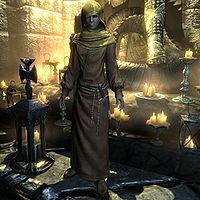 With the worship of Talos being illegal in Skyrim, Jora has no choice but to pretend the White-Gold Concordat never happened and that Ulfric Stormcloak will be able to keep the Thalmor and Imperial Legion away from Windhelm. She wakes up every morning at 8am, then strolls around the chapel hall all day long, interrupted only by a one-hour lunch at the Candlehearth Hall at 1pm. At 5pm she browses the market for two hours, then spends the rest of the evening at Candlehearth. At midnight, she heads back to the chapel and goes to bed. She wears a set of hooded monk robes with a pair of shoes. She carries an iron dagger and a selection of common items and gold. If you meet her inside the Temple, she will encourage you to use the available altar: "To receive the blessing of Talos, you have only to pray at the altar." Otherwise she will provide basic information on Talos and what she stands for as a priestess: "You know about Talos? He founded the Empire! ", "We're the only Temple in Skyrim that can openly worship Talos. ", "Those awful Thalmor can't touch us, thanks to Ulfric." and "I can't believe the Empire would turn its back on Talos." She will end conversations with either, "Blessings of Arkay be upon you." or "Too few remember to honor the god of the dead. Do not be one of those." As a devout worshipper of Talos, she will gladly provide some background inforation: "Talos, who in life was known as Tiber Septim, united Tamriel and founded the Empire. He was rewarded for his deeds by being joined with the Divines in eternal glory. The only mortal to do so. We worship him that we might follow in his path. We can't literally join him in the heavens, but we may do our best to know them here on Nirn." When asked about how devout the Windhelm citizens are, she will respond: "Like anyone, a crisis will push them towards devotion. I've been seeing a lot of the Shatter-Shields, since they lost their daughter. Hillevi Cruel-Sea comes in a lot, but I haven't seen her husband here in years. Ulfric prays for strength. I speak to Captain Lonely-Gale, but he doesn't spend much time here. Too busy." When asked about what the war means for worshipping Talos, she will reveal her hatred towards the Thalmor: "The Empire's elven puppetmasters never cared much for the idea of a human becoming a divine. So the worship of Talos is outlawed. Skyrim doesn't take kindly to being told what to do. And to try and forget Talos, well... they may as well ordered us all to cut off our ears." Niranye: "Hello, Jora. I'm glad to see you. In fact, I was just thinking about you and your husband." Jora: "Is that so? And what were you thinking, exactly?" Niranye: "Well, I've heard awful stories about these Thalmor, and how they're rounding up everyone who still worships Talos. The interrogations are quite merciless, from what I've heard. I fear for you and your husband, should the Thamlor [sic] come here. But perhaps there's a way I can help." Jora: "I doubt Ulfric would let Thalmor into Windhelm without a fight. But please, do continue. How would you help us?" Niranye: "Well, let's just say that I know some people who are experts at helping others disappear when they need to. They are discreet and thorough, though not inexpensive. I hope you'll keep that in mind, should the worst come to pass." Jora: "We accept the risks that come with our faith, but I'll keep your offer in mind. Thank you, Niranye." Elda: "Oh, Jora. Good to see you. I was wondering if you might ask Lortheim something for me." Jora: "Don't bother. I don't have much chance of seeing my husband these days. He's always up in the palace with Ulfric." Elda: "Oh, I'm sorry to hear that. Is everything all right?" Jora: "It's been better, I'll be honest with you." Elda: "Here, let me get you some mead. This one's on me." Jora: "I just don't know what to do anymore. He's hardly ever in the temple. I see him at breakfast, and that's it." Elda: "I know, dear. He's a busy man, though, and loyal to the Stormcloaks." Jora: "What about being loyal to his wife?" Elda: "I... I'm sorry, dear, I've got some other customers. I'll be back around in a minute." Her closing remarks are more appropriate for a priestess of Arkay: "Blessings of Arkay be upon you." or "Too few remember to honor the god of the dead. Do not be one of those." This page was last modified on 22 June 2018, at 04:53.